McCrosky’s Wizard® quick-change, collets and top drivers allows for more efficient use of manual machines by helping them run multiple jobs. "…Multiple tool jobs on manual machines become continuous processes which increase production and cut costs." McCrosky’s Wizard® Quick-Change chucks enable an operator to insert a new tool into a chuck, disengage that tool when desired,and insert the next tool, easily and quickly. Thus multiple tool jobs on manual machines become continuous processes which increase production and cut costs. The chuck portion of a Wizard® Quick-Change assembly consists of the body and the spring-operated locking collar. Both are hardened and ground to ensure extreme accuracy and efficient service. 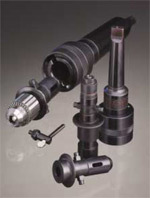 The bottom of the bore in the chuck body is beveled to correspond with the bevel on the end of the collet, and two slots are provided to engage the driving lugs on the collet, permitting the driving force to be transmitted directly from the chuck to the collet. The locking collar, which serves simply to lock the collet into the chuck and permit easy disengagement, is spring operated. It is knurled on the outside and has two inside latches. When the operator pushes the Wizard® collet with the new tool into the chuck, the driving lugs on the collet press against the underside of these latches forcing the collar backward against the spring. As the collet passes completely into the chuck body, the spring closes the collar and locks the collet securely in the chuck.